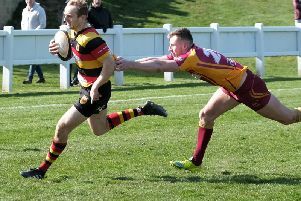 Harrogate RUFC’s director of rugby Dave Doherty said that his side can only concern themselves with their own performances as the battle for National Three North’s solitary play-off spot hots up. The Rudding Lane outfit secured a bonus-point derby success over old foes Ilkley on Saturday, but their destiny is now out of their own hands with Hull in the box seat, four points ahead in the runners-up position. And while ‘Gate will be hoping that their promotion rivals slip up in one of their remaining four fixtures, Doherty is adamant that his side must remain focused on taking care of business when they take the field. “Hull’s form is completely out of our control, so we’ll just leave it to them and worry about what we are doing,” he said. “The challenge is to try and catch them and we’ll keep going all the way to the end. “We’re still confident that we can do it, but if we focus on making sure our performances are right in the last four games, then the results will take care of themselves and we’ll be in with a chance. “We took five points from the Ilkley game and I’m delighted with that. They’re a good side with some very talented players and they came into the match on a run of form. The first quarter of the game did indeed belong to ‘Gate, who eased their way into the ascendancy and appeared to be in full control after wing Harry Jukes’ brace. Both sides got their hands on the ball early on, but the pressure began to build on the Ilkley defence just before the 10-minute-mark. Doherty’s men patiently went through the phases, probing away until the moment came to spread the ball to the right flank where Jukes took possession and glided over the whitewash. Luke White added a straightforward conversion for 7-0 in the 12th minute, and although the visitors briefly threatened at the other end, the home lead was soon extended. Harrogate won a penalty that White sent to the corner and, from the resulting line-out the Aces’ pack got their drive on, sucking numbers in towards the ball. Possession was then quickly recycled and White’s perfectly-weighted cross-kick from a central position out to the right corner was gobbled up by Jukes who had the simplest of tasks to finish off. White was off-target with his attempt to add the extras, but the hosts seemed to be well on top. The dynamic of the game did not change immediately, but slowly Ilkley began to play their way back in to the contest. The last quarter of an hour of the opening period belonged to them, however with the ‘Gate defence looking as solid, it seemed that the sides would go into the interval with the score at 12-0. That was until, just seconds before the half-time whistle, outside centre Pat Atkinson danced through a number of tackles to register a fine individual try converted by full-back Ben Magee. The momentum remained with the West Yorkshiremen after the resumption and they began to turn the screw. A Magee penalty brought them to within just two points at 12-10 on 58 minutes, but after a sloppy period of play that saw possessionchange hands on a number of occasions in quick succession, ‘Gate suddenly re-asserted themselves. Another catch -and-drive from a penalty kicked to the corner resulted in Jonny Coser being able to burrow his way over the line from close range. White converted and the Aces then came again, battering away at the Ilkley line and working an overlap. The ball eventually found its way to Oli Rosillo for easy finish in the corner that secured his side a bonus point. White booted over a superb kick from close to the touchline to make it 26-10 and in the passage of play that followed a fifth try looked on the cards. The visitors seemed to be creaking in defence, but they eventually broke out and a searing raid featuring some stunning interplay looked to have brought about a second touchdown, only for referee Dave Charlton to rule them held up over the line. Undeterred, Ilkley came again, finishing the game on top as flanker Pat Power ran in wide on the right to register a last-gasp consolation. Next up for Doherty and his troops is Saturday’s meeting with rock-bottom Pocklington at the Stratstone Stadium.